In 1956 Jaroslav Kurzweil was involved in special phenomena occurring in ordinary differential equations with fast oscillating entries which have not been justified by theories and approaches known at those times. For explaining the observed results he constructed a tool, which reminded in some aspects strongly the way how the Perron integral using minor and major functions was constructed. The story ended by a success and the tool became an independent, self-contained object, the generalized Perron integral. Since the generalized Perron integral occurred to be very interesting and, due to the need of research, it was described via integral sums of Riemann type, Jaroslav Kurzweil described it in detail in his very first paper  on the topic and used it in a series of subsequent writings on ordinary differential equations. Only a restricted number of people knew at this times about the existence of a newly defined integral. There is no reason to be surprised by this fact, looking at the title of  nobody can expect deep interest of mathematicians involved in integration theory in this paper. In the same time Ralph Henstock worked on variational approaches to integrals, no existing connection to Kurzweil in those days. For the first time the possible relation is mentioned cautiously in Henstock’s booklet . It was discovered early in the sixties that in the case of real valued functions both approaches (that of Henstock and of Kurzweil) are equivalent and, of course, the definition of the very general non-absolutely convergent integral based on Riemann-type integral sums came to the foreground. The following chapter on Riesz spaces should also be accessible to a large class of readers. We not only mention slightly more general structures such as lattice ordered groups, but also some basic facts about MV-algebras: these are important for multivalued logic. 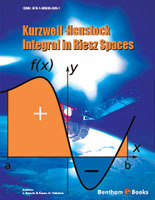 The general theory of the Kurzweil-Henstock integral in Riesz spaces is presented in the third chapter. As discovered by J. D. M. Wright and D. Fremlin, there exists a sufficient and necessary condition for the possibility to extend Riesz space-valued Daniell integrals from the set of simple functions to the set of integrable functions, or a Riesz space-valued measure from an algebra to the generated σ-algebra. This condition, which is called weak σ-distributivity, holds in any probability MV-algebra. Chapters 4 - 6 contain new and, in our opinion, important results on convergence theorems and multiple integrals. These chapters also contain a systematic exposition of the Kurzweil-Henstock integral theory for functions defined on abstract topological spaces. Recall that most papers on the Kurzweil-Henstock integral use as a domain only Euclidean spaces. Some more special topics are treated in chapters 7 - 10 and 13, namely improper integrals, SL-integrals, the Pettis and Choquet approach, and integration in metric semigroups. The Choquet integral (or its Šipoš symmetric variant) is of particular importance in non-additive measures. As we mentioned before, the aim of this monograph is two-fold. First, it can be understood as an introductory textbook to the Kurzweil-Henstock integral as well as to some algebraic structures (Riesz spaces, l-groups, MV-algebras) which are important from the viewpoint of applications to integration and probability theory. Second, it offers some possibilities of further developments including important open problems in this attractive area, with a glimpse of the diversity of directions in which the current research is moving. The first author wants to dedicate this book to the loving memory of his mother Teresa who passed away on August 2nd, 2004, while Antonio was in Slovakia for cooperating with Prof. Riecan. She always helped him, not only in overcoming many difficulties in his personal life, but she also encouraged him to leave Italy in order to broaden his fields of interest and to enrich his personal experiences. That is why he decided to participate in the Winter School on Measure Theory in Liptovský Ján in 1993, which marked the beginning of a fruitful cooperation with his Slovak colleagues and friendship with marvellous people from Slovakia. The present book is the outcome of this wonderful cooperation and friendship which, hopefully, will continue for still many years to come. The third author wants to thank Antonio Boccuto and Beloslav Riecan for the nice teamwork and friendship and Prof. Riecan for the scientific upbringing. We would like to thank Prof. Štefan Schwabik for writing the foreword and Bentham Science Publishers, particularly Manager Bushra Siddiqui, for their support and efforts.